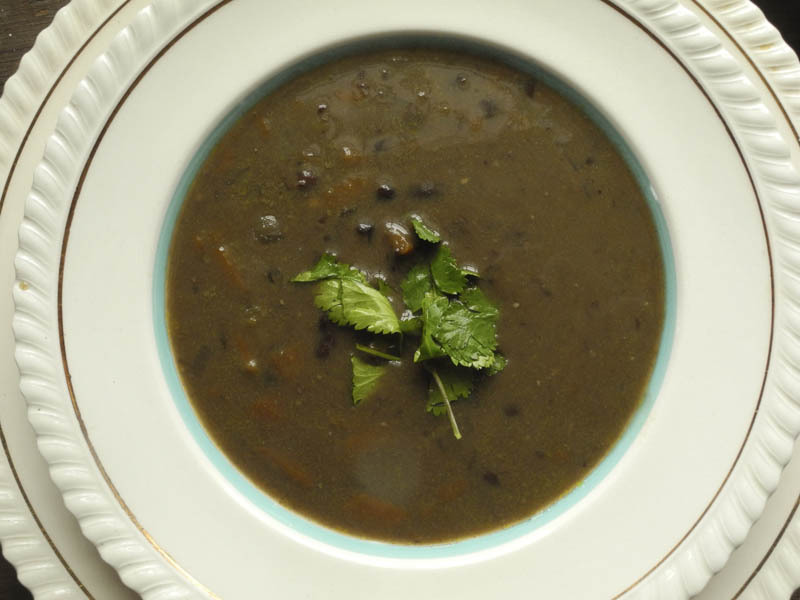 I thought it would be nice to share a recipe as a Happy Thanksgiving greeting, even though this soup is not at all a traditional Thanksgiving food. It is a nice soup for winter for those who like black beans and who like the flavor of curry. The recipe comes from my friend, the artist Lynn Rosenfeld, who gave it to me years ago after I had enjoyed the soup at her house. It's pretty easy and straightforward, though you do have to soak the beans overnight before cooking. Some of the beans are pureed in a food processor to give a smooth background to the soup. Place oil, butter, onion, and carrot in a saucepan and cook at medium heat until the vegetables are soft, about 10 minutes. Stir in garlic, cook a couple of minutes; add curry and coriander and cook two minutes more, stirring. Add beans and broth or water, bring to a boil, then lower heat and simmer until beans are nearly soft, then add salt. When beans are fully cooked, put about half the beans in a food processor and process until smooth. Return the pureed beans to the pot. Add more salt if needed, and pepper. I made such a huge mistake when making this print; some little ones too, but a really inattentive big one: I forgot to reverse the drawing when I traced it onto the cardboard. Lesson number one in printmaking: the image comes out backwards from how it is on the plate. But you know what? it turned out really well. I ended up liking the backwards image better than the original sketch, once I turned it upside down. Here the half circle is balanced on the rectangle, but I like the energy of the rectangle balancing on the half circle; it feels more lively to me. So I suppose a happy error now and then is a very good thing. Here's a detail of the print that I photographed primarily to give a sense of the texture of the paper, which is quite beautiful. If you click to enlarge, perhaps you'll get a better idea of it. I really enjoy all the papers I'm working with and their subtleties are lost in photos. Untitled 42, ink on Twinrocker paper, 14 x 10 1/2 in. 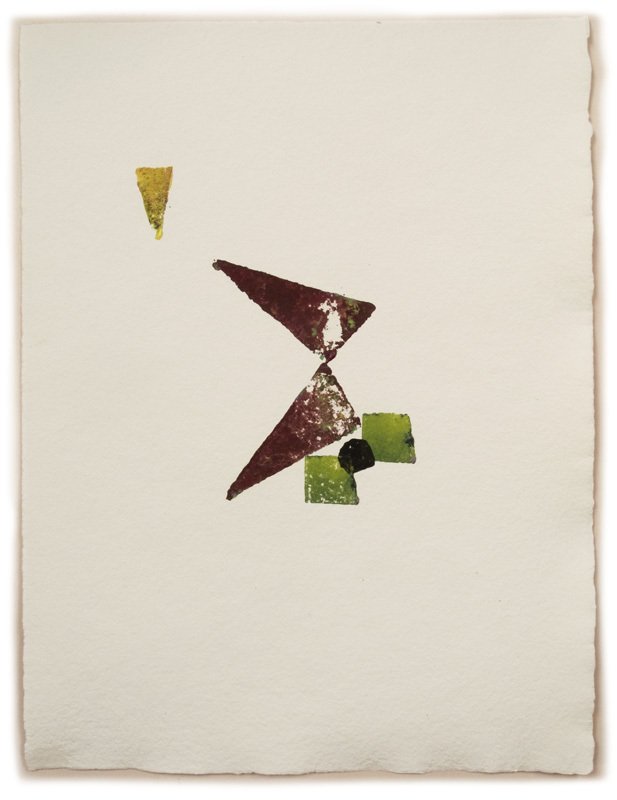 After printing Touch, I did several potato prints, with triangles featuring in a couple of them. 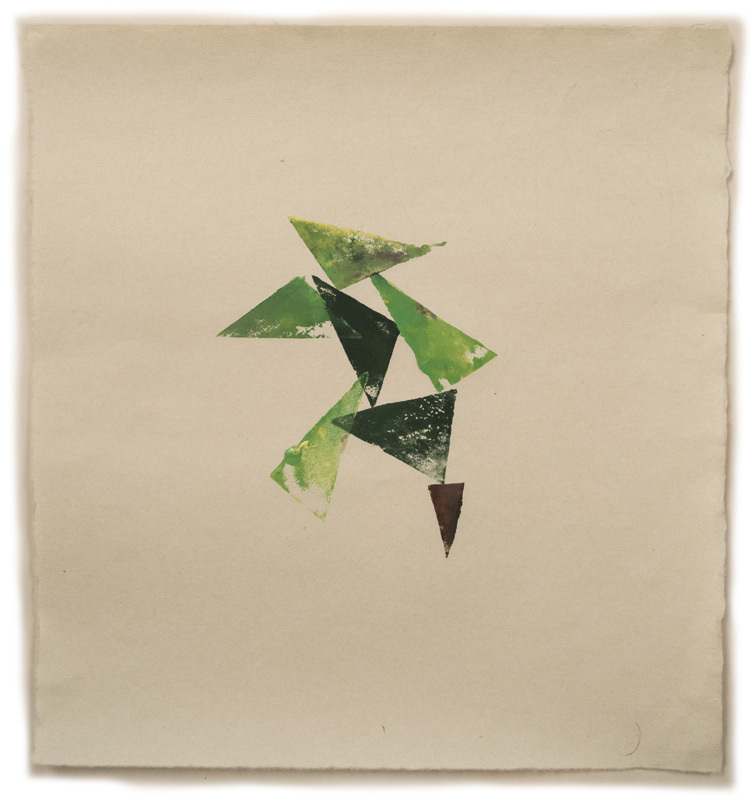 Untitled 43, ink on Twinrocker paper, 7 3/8 x 7 1/2 in. This small print kept reminding me of an insect. Untitled 44, ink on Nishinouchi paper, 15 x 14 in. More triangles balanced or tipping, touching or overlapping, maybe held up by the small red triangle. 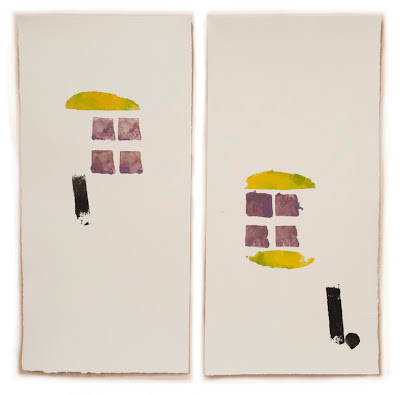 Untitled 45, ink on Twinrocker paper, 2 panels each 15 x 7 1/4 in. 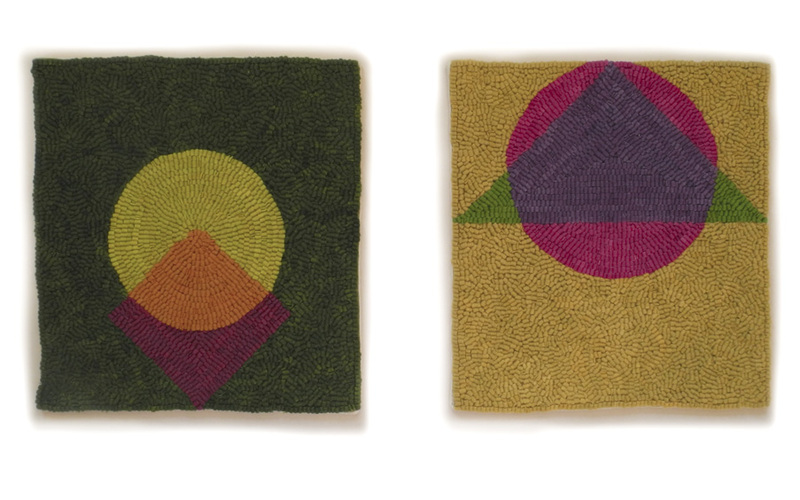 I enjoy making diptychs, seeing how shapes react to each other across a gap. Untitled 46, ink on Twinrocker paper, 7 1/4 x 7 1/2 in. The regularity of this small piece is broken by the splashes of ink that contrary to expectation spill upward. 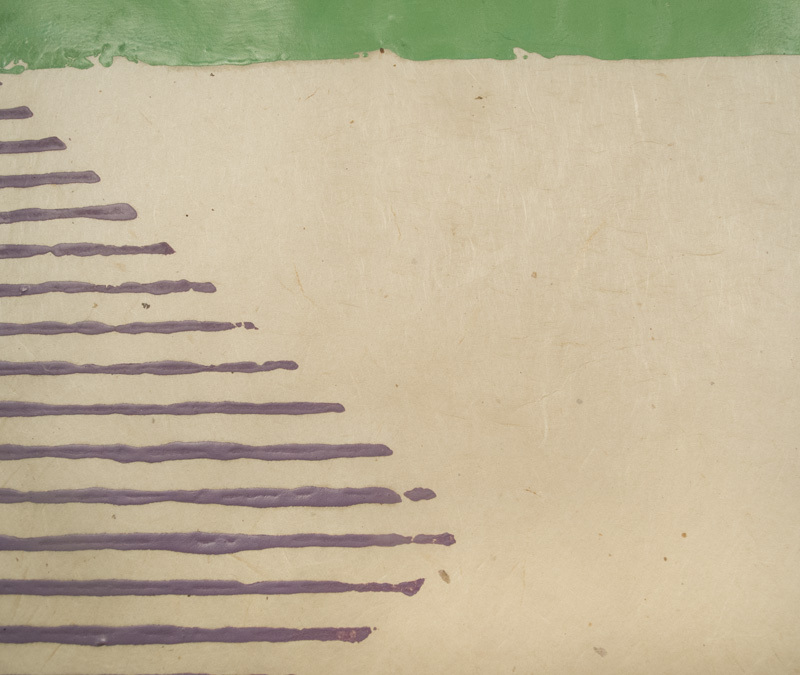 Untitled 47, ink on Gampi Smooth paper, 9 3/4 x 25 in. 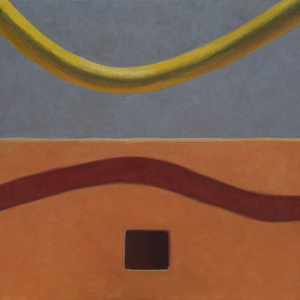 It's a challenge to make a composition across a long narrow surface, though easier with a landscape. I'm not sure I succeeded here, but what I was trying to do was have the eye bounce across the surface following the green forms, punctuated by black dots and the finality of dot and square. 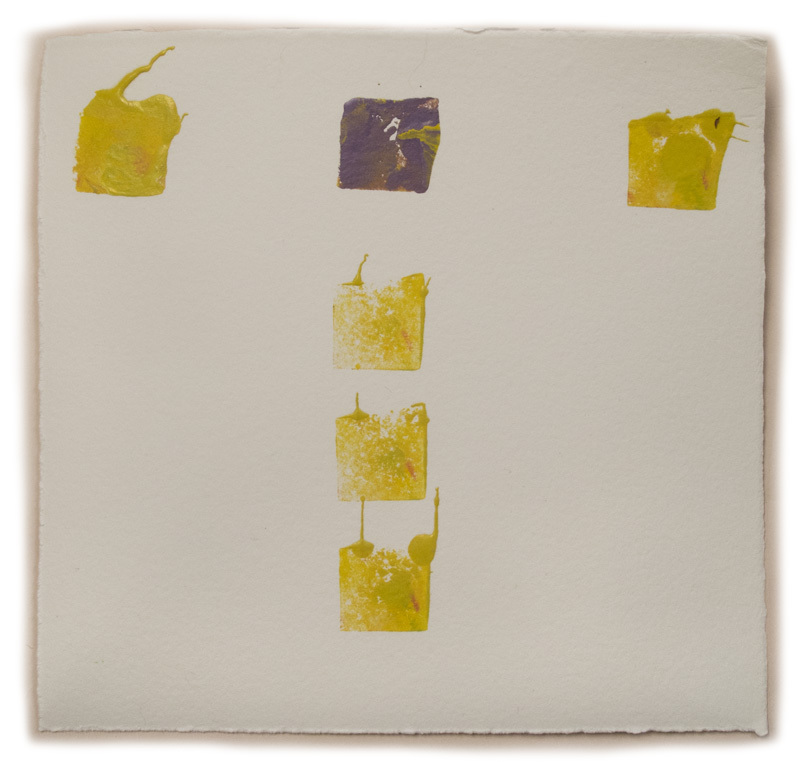 Finding the balance between form and emptiness continues to intrigue me with these potato prints. The grand and awkward moose is the most impressive creature I've ever seen. Although I've spotted quite a few cows––the female moose––on my land and in the woods around it, I've never seen a bull moose with a large rack. 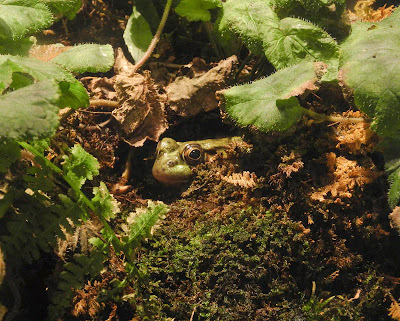 It took my first visit to the delightful Montshire Museum of Science to see this engaging specimen. 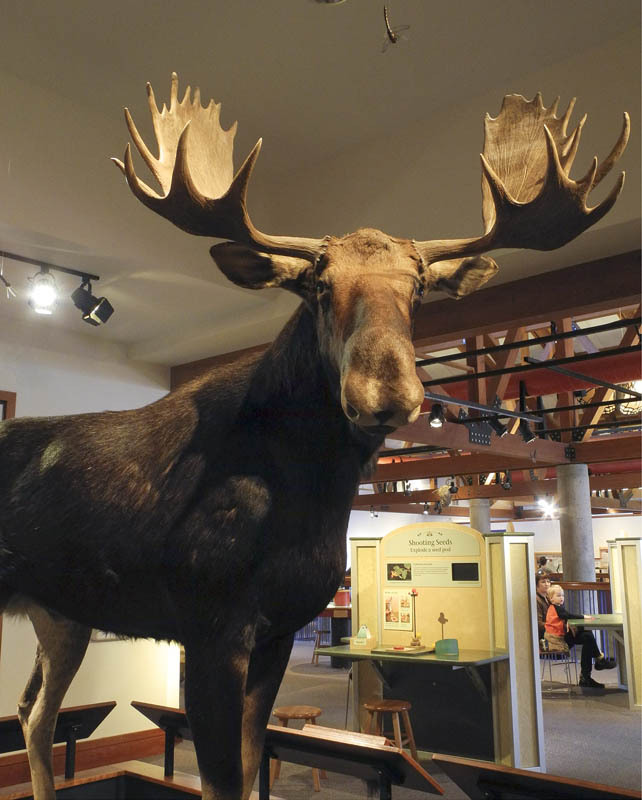 The Montshire is a small natural history museum, located in Norwich, Vermont, a relatively new institution with many hands-on activities especially engaging for children. Another natural history museum in Vermont, The Fairbanks Museum and Planetarium, is a very different sort of place, a step into the 19th century, which I wrote about here. 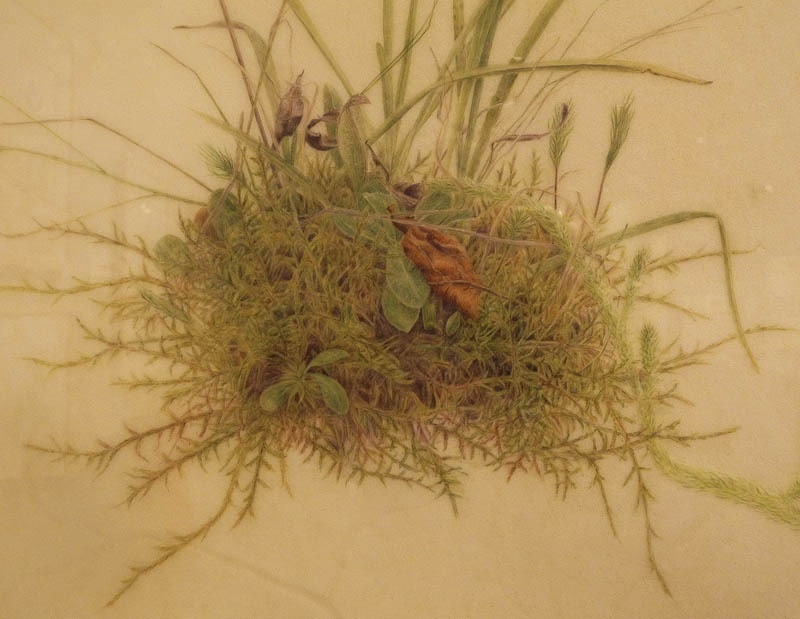 The special exhibition that got me to the museum was "From the Mountains to the Sea: Plants, Trees, and Shrubs of New England", a juried show of work by members of the New England Society of Botanical Artists (see some examples below). 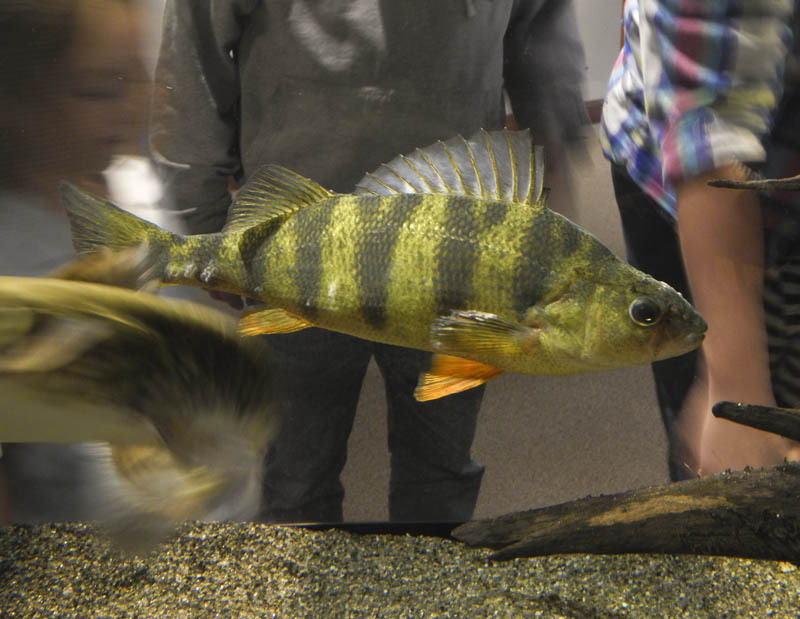 But before going upstairs to the exhibit, I wandered around on the first floor, amid excited children enjoying the displays of native fish and amphibians. This Yellow Perch with bright orange lower fins was swimming about in front of an audience. 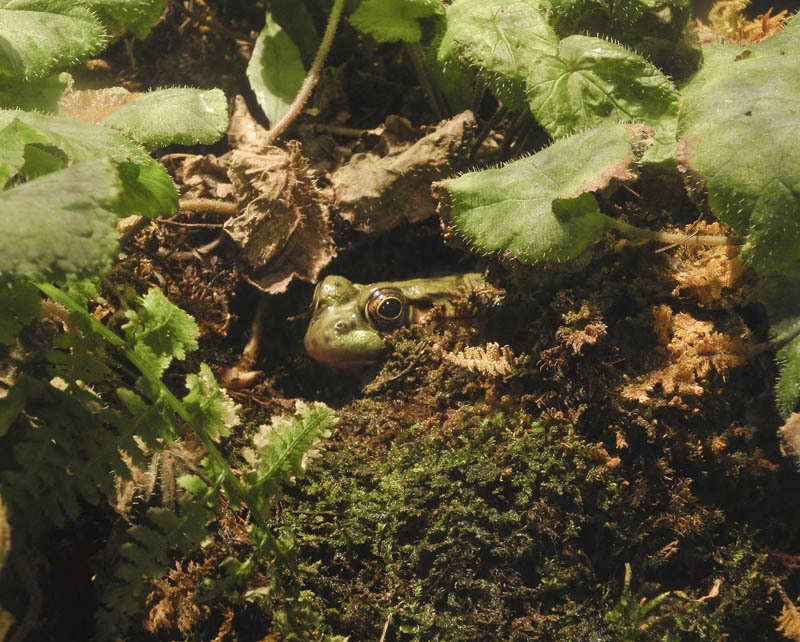 A Green Frog peaks out of its hiding place, blending in with the green life around it. 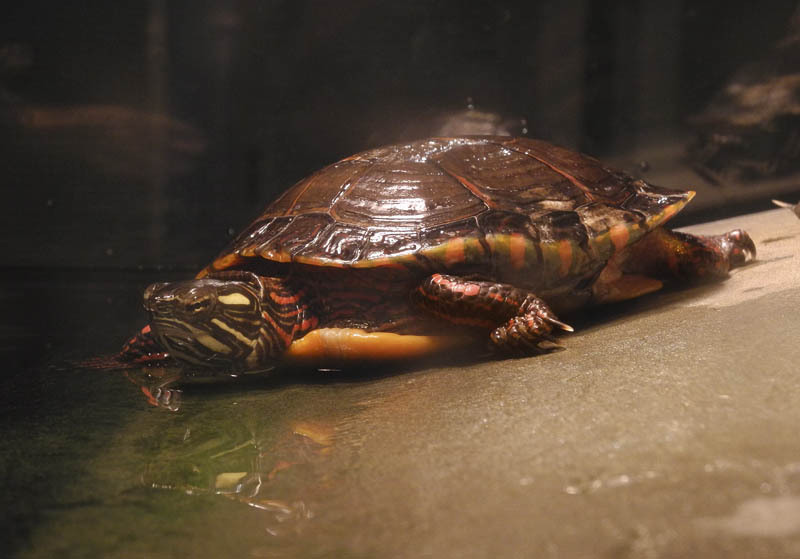 I loved seeing the Painted Turtles, which look like fierce prehistoric beasts, scary yet very decorative. 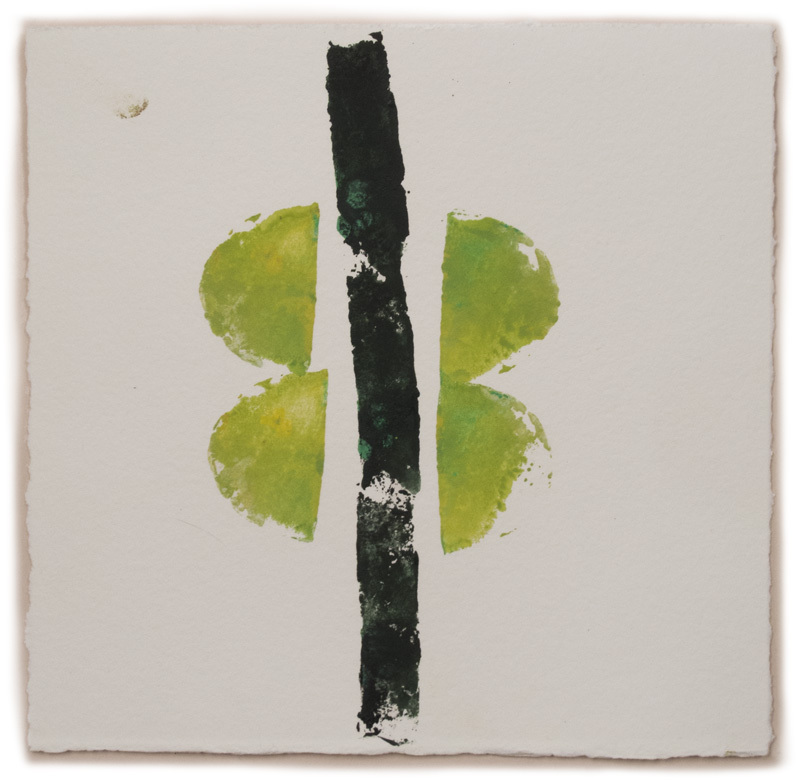 A very different mood was in evidence in the exhibit of contemporary botanical drawings, one of loving and precise attentiveness. The aim of the New England Society of Botanical Artists is to "increase public awareness of the significance of preserving New England's native plants." This lovely etching seems to owe a great deal to the art of Japan in its simple yet dramatic composition. Susan Sawyer, Black Ash, Five Winter Twigs; watercolor over graphite. 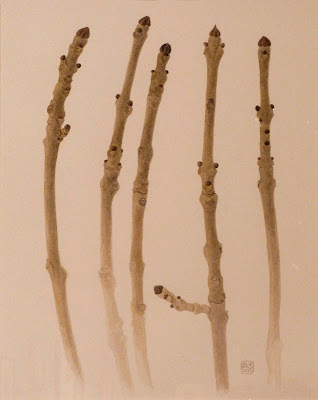 A seemingly mundane subject becomes fascinating by the small differences from twig to twig, with the group standing together, slightly leaning and curving, a harmonious quintet, with one amusing little pushy outgrowth. 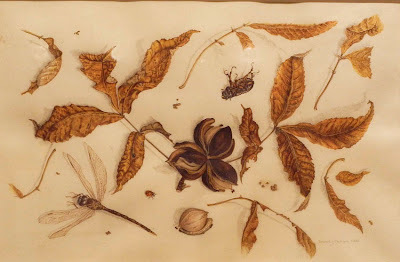 Beverly Duncan, Autumn Remains - Pignut Hickory; watercolor and pencil on parchment. The dried remains of leaves and nuts and insects achieve an eloquence through Duncan's careful looking and recording. 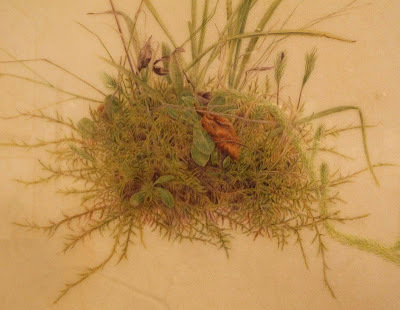 Kelly Leahy Radding, Nodding Ladies' Tresses Orchid, Schreber's Big Red Stem Moss, Running Clubmoss, Common Haircap Moss, detail; watercolor on parchment. I love the delicacy of this drawing and its detailed observation. I learned that botanical drawing has a long history, with accurately drawn plants beginning most notably in 1530, with Otto Brunfels' Herbarium vivae eicones, illustrated with woodcuts by Hans Weiditz. 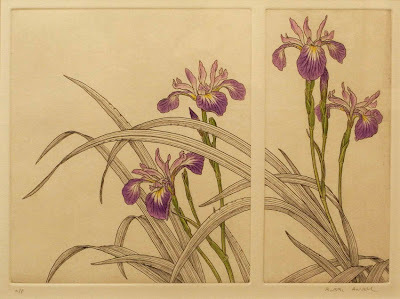 Weiditz drew his plants from life, instead of copying older images as was the practice previously. Many books were produced in later years, some for practical reasons such as medicinal plants, but many for the sheer beauty of flowers. 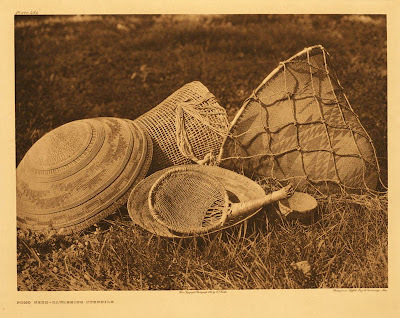 This show was full of ordinary beauty, found in things often overlooked. 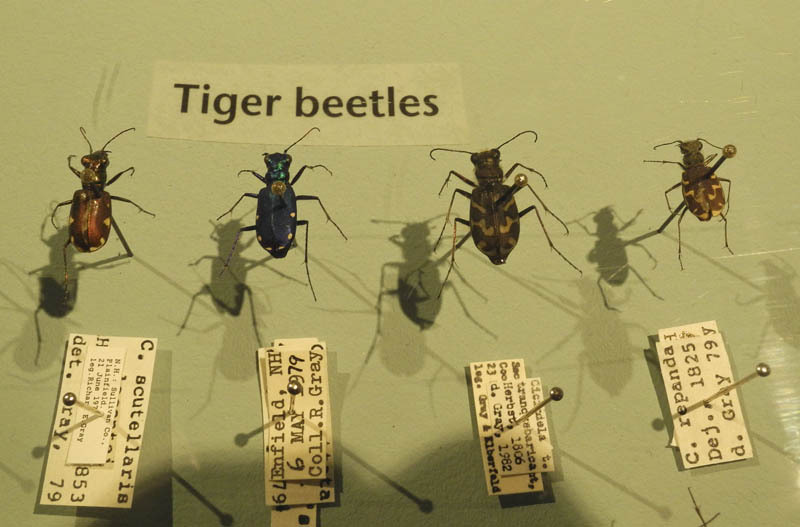 There were other kinds of beauty to be seen upstairs at the Montshire, especially in their insect collections. 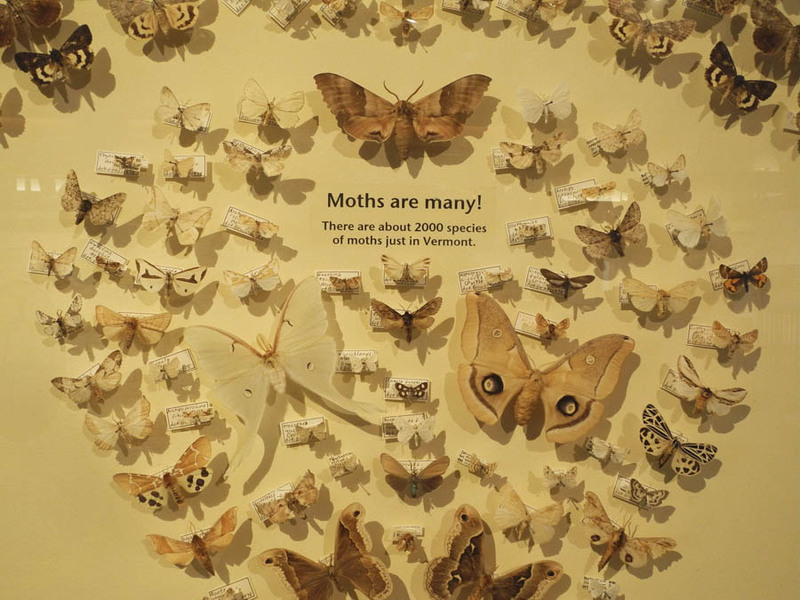 The somewhat faded display of moths was quite amazing: 2000 species in Vermont! I loved the spotted black and white moths with their dramatic designs (click to enlarge). While I was bent over the beetle display, enjoying the brilliant coloration and varied designs, I was joined in admiration by a 10 year old boy who enthusiastically pointed out his favorites. 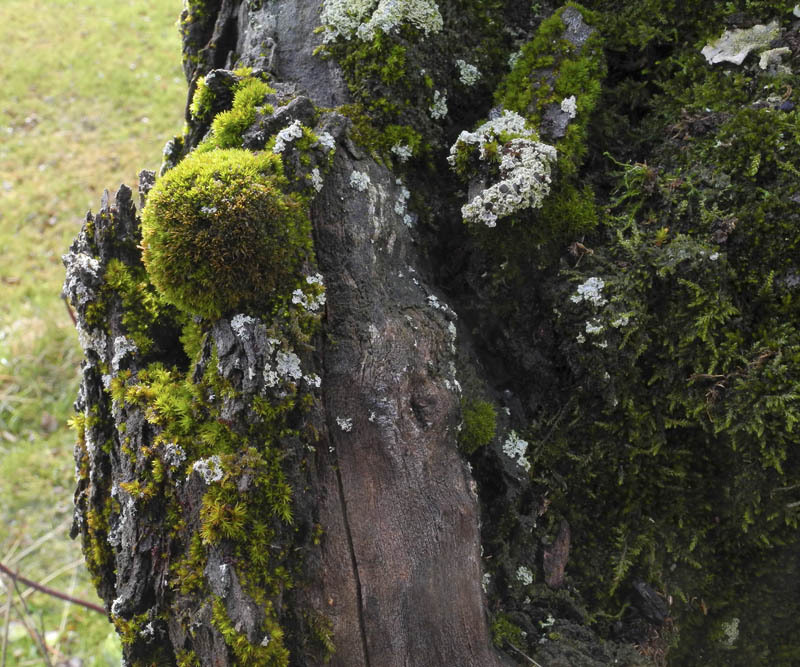 It was wonderful to see the kids having such a good time noticing things, learning about the world around them. A very popular exhibit was of a non-native species of ant, a Leafcutter ant colony (some great photos at the link). 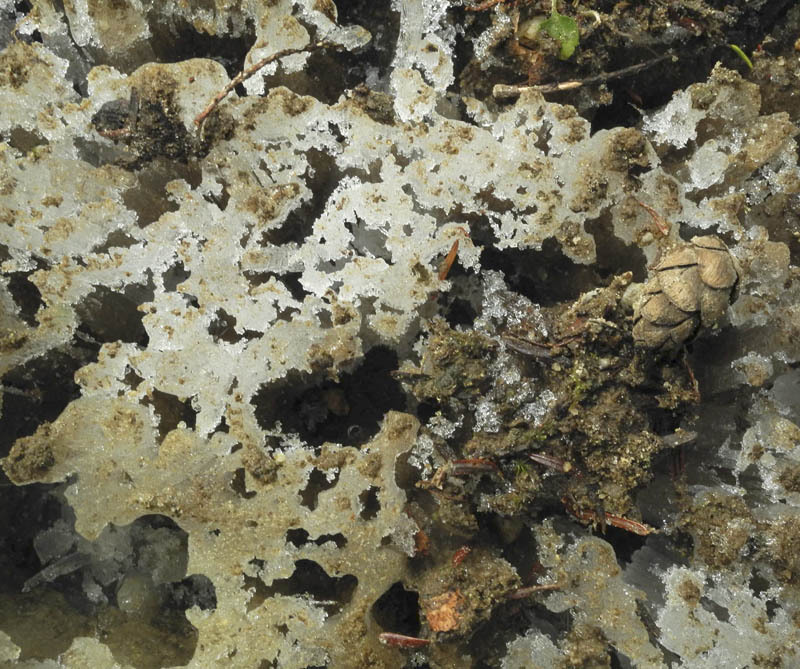 The ants cut up leaves, carrying pieces many times their size to the fungus garden where the leaves are chewed and made into a paste; this paste becomes a fungus that the ants feed on. 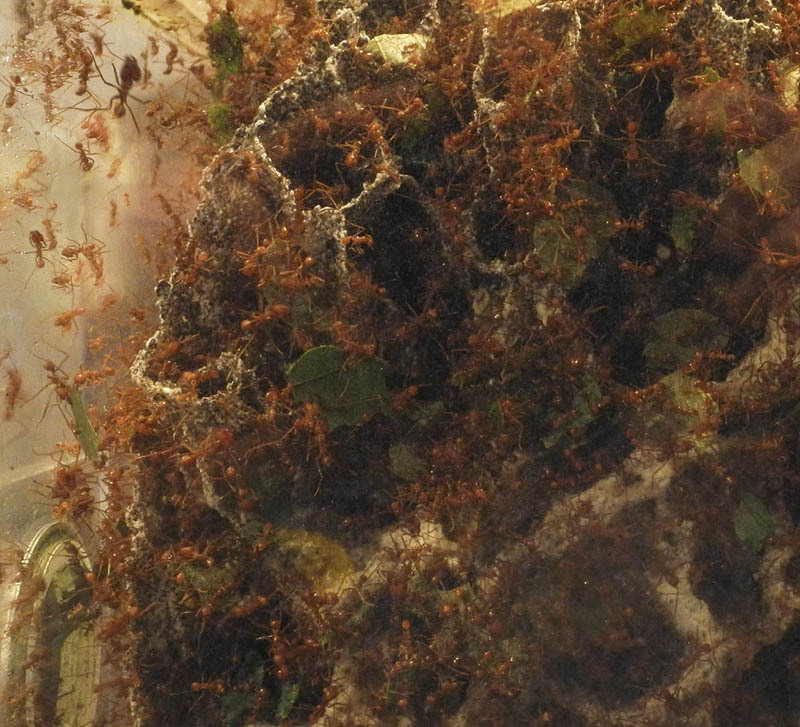 The organization of these ants is quite remarkable. 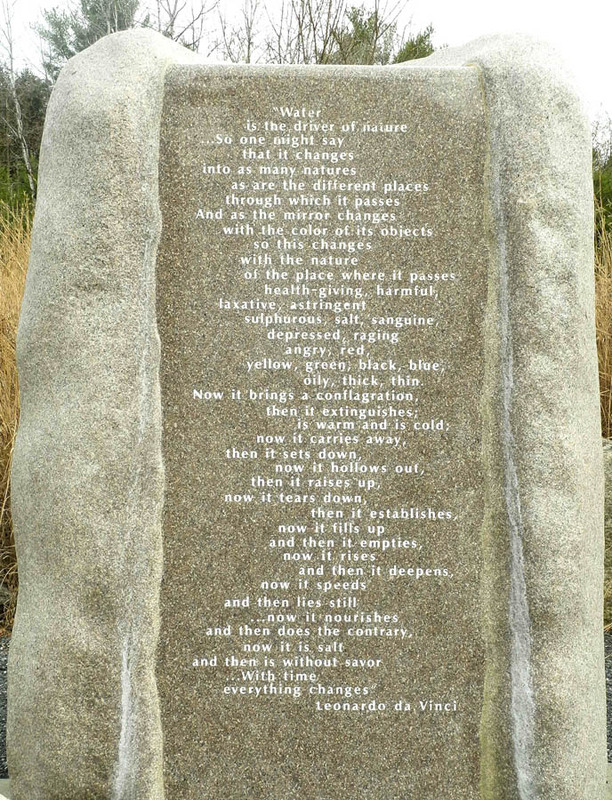 Walking outside the museum, I saw many water displays, all closed down for winter but watched over by a text from Leonardo da Vinci on water, "the driver of nature". 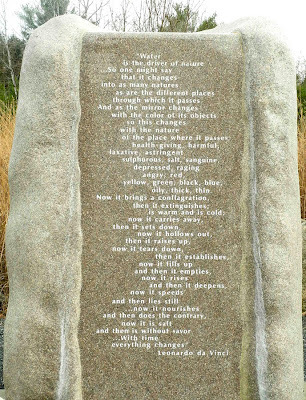 He saw water as always changing: "Now it brings a conflagration, then it extinguishes; is warm and is cold; now it carries away, then it sets down......" (click on image to enlarge so you can read it). Water is all important and we are too careless with this precious resource. The flowing water of the Connecticut River is alongside the museum, where I could see it from a very different vantage point than from that bridge in the distance which I cross to get to Hanover, NH. 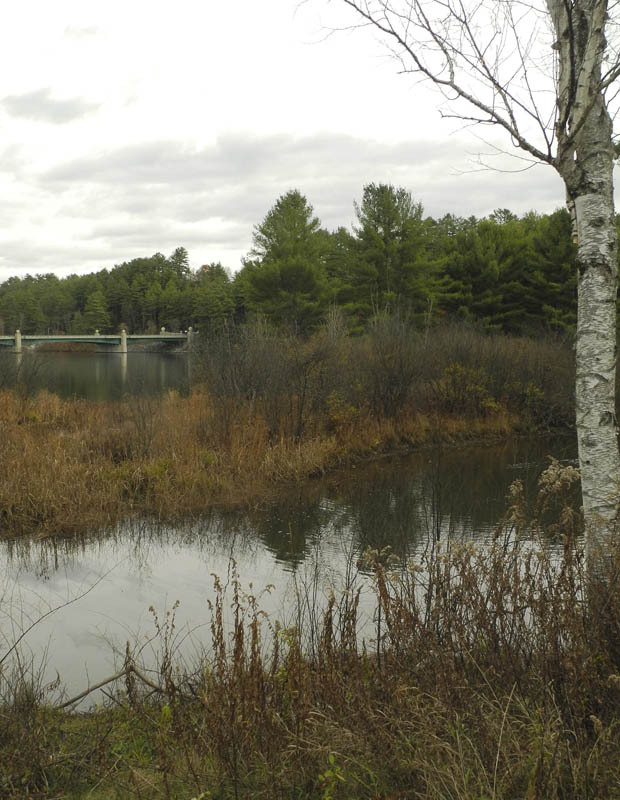 I could almost imagine the river wild as it was a few hundred years ago, with only native plants gracing its banks. A New Painting: "Angled Corner"
Angled Corner, egg tempera on calfskin parchment, 6 x 7 1/2 in. Working on this painting pointed out to me yet again that I have to approach my work as abstraction rather than as a representation of an actual thing. The lesson was in the background of the lime green shapes, now a dark brownish red. I painted and repainted that background four times, wiping it off after each unhappy resolution. 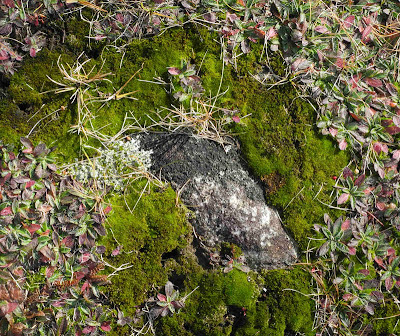 The source image had a background of gray gravel, which I thought would not do at all, not unless I changed the main color of the piece; I did not want to do that, since I was enjoying the challenge of the sharp color. So I started with an earth red color, but its warmth did not work with the cold yellow: I wiped it off. Then I thought that a very intense cold red might work, like an Alizarin crimson, maybe without shadows, just flat; tried that, nope. Ah-hah, maybe color was the problem and it needed to be white, with shadows, to pick up the white on the bottom left. I thought that was a good solution, and looked at it for a couple of days, thinking the painting was done. But I had a niggling doubt that wouldn't go away; there was just something missing. So I took a deep breath and wiped off the paint yet again, going back to the idea of red, but this time using a mixture of Cadmium red purple and Cadmium brown for the darks; the lights also have white and a bit of cadmium vermillion and cadmium yellow. It's a rich dark that I think plays well with the bright greenish yellow; I was glad I wiped off the white. Light is an important subject of my paintings, most often seen as light and shadow. 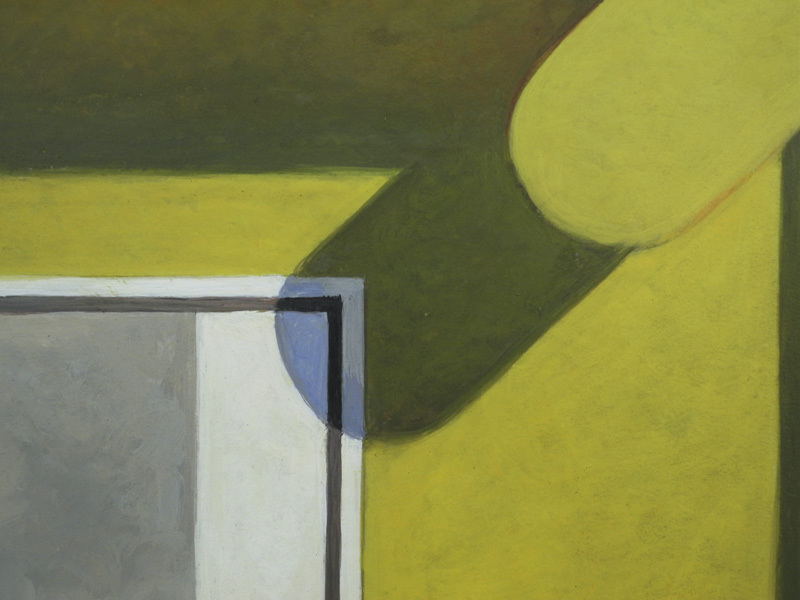 It's always difficult to paint a convincing shadow, one that has enough of the foundation color to read as shadow and not shape, different enough to give a sense of bright light. Shadows tend to be cool, but often have warm reflected lights within them. 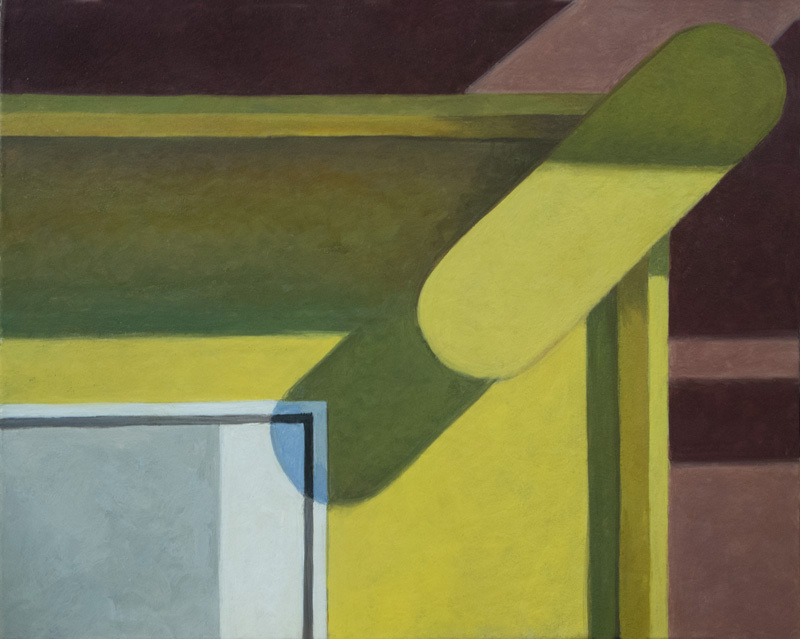 Getting the balance right of light within a dark of shadow usually entails many reworkings of color and value. And when it works, wow, what a thrill! 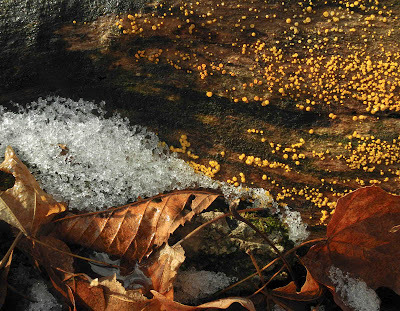 This morning I woke up to a snow-dusted landscape, but yesterday was mild, with temperatures in the 50s. I had done a load of laundry in the morning and when I realized how warm it was I decided to hang it outdoors, for perhaps the last time this season. 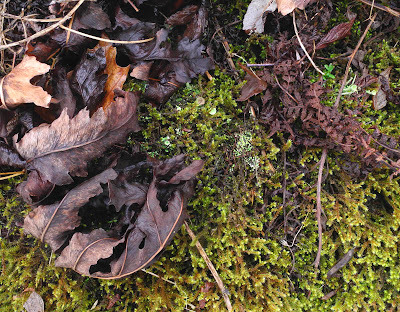 As I stepped into the backyard, I noticed that the colors of the dried plants were enriched by previous night's rain; I also saw that the mosses, refreshed by recent rain and snow, were back to their brilliant greens. 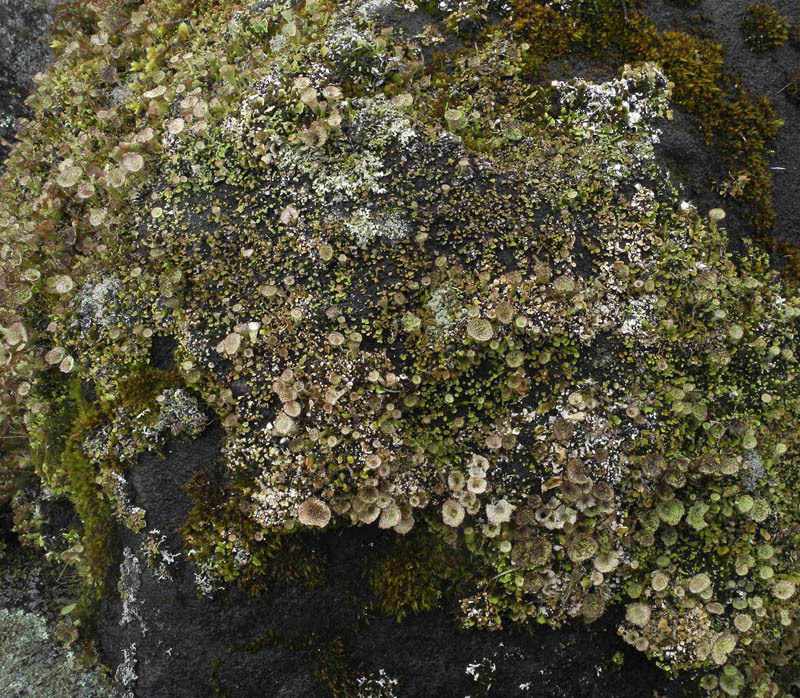 Looking at them closely is like entering worlds in miniature, with mountain peaks and deep valleys, with primeval forests and hanging gardens. 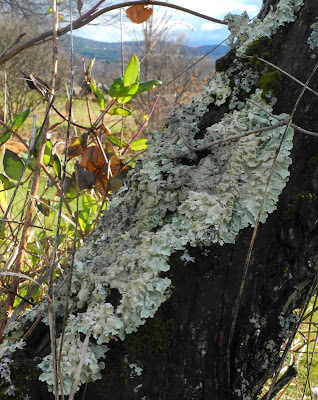 On the same plum tree stump as the garden above is this decorative frill of lichen, delicate in color but extravagant in form. 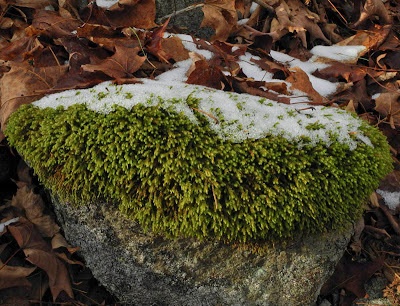 The stone walls surrounding the yard are now covered with life: mosses, small plants, grasses. 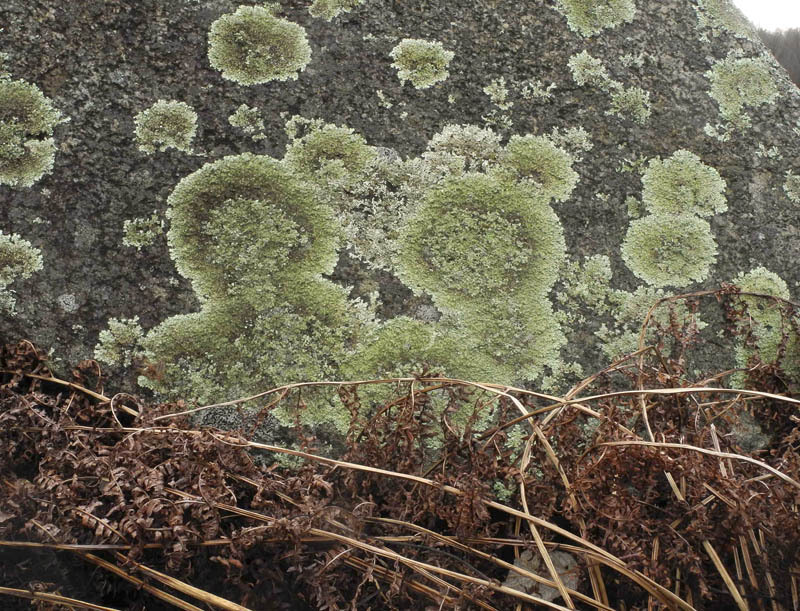 The lush green is set to engulf the stone. 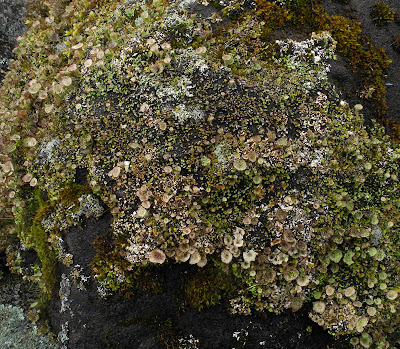 A black rock sparkles with a pattern of small dots and the cups of fruiting bodies, making a beautiful haze of color. *As always, you can click on the images to enlarge them to see more detail. 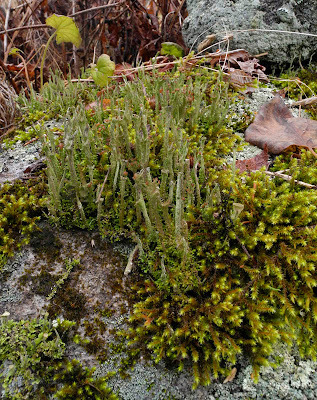 Another tiny forest covers a rock, with fruiting bodies like towering ancient trees. 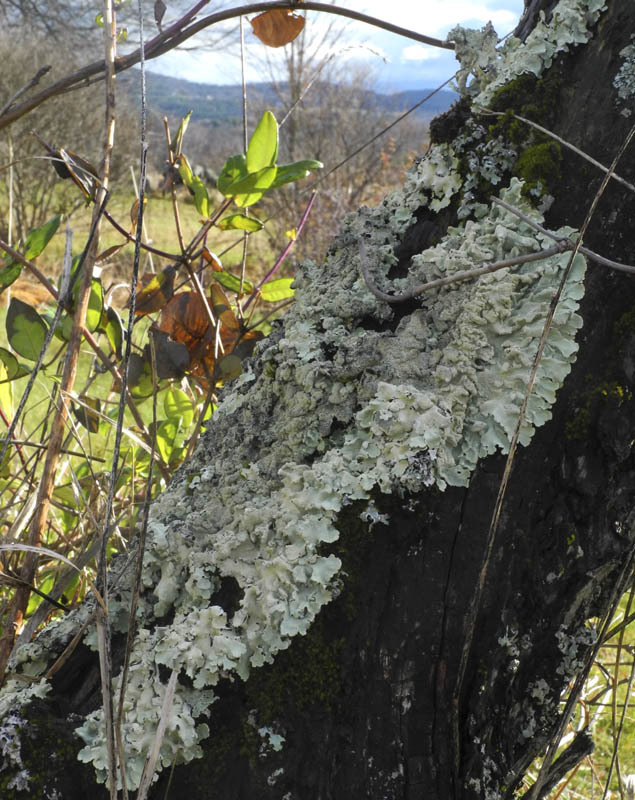 This lichen surprised me with its repeated circular forms, looking as though carefully designed in color, shape, and placement. 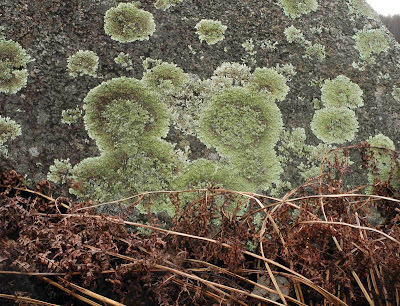 Dead ferns are gracefully arranged on a green ground, having some of the elegance of Art Nouveau's organic patterns. 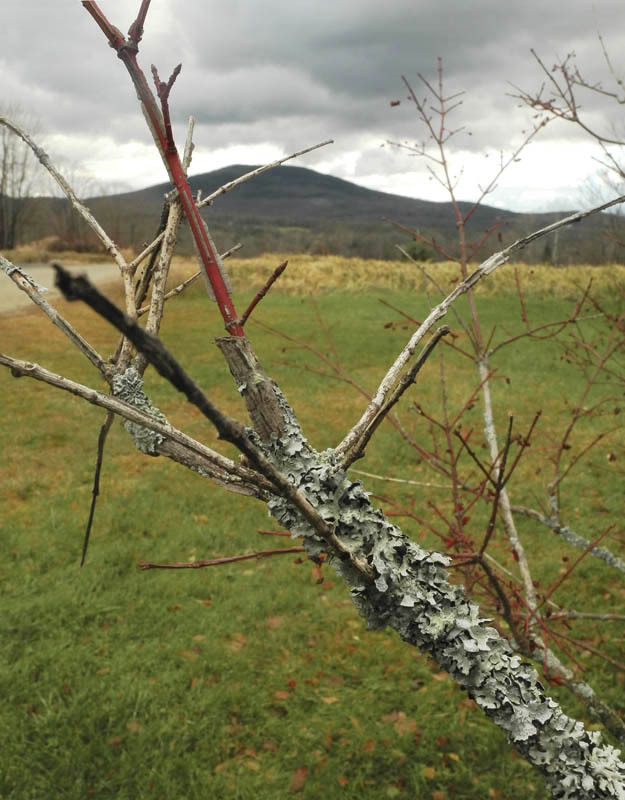 When I looked from the stone walls toward the Burning Bush in front of the barn, I saw a green haze of branches topped by red twigs, the green a similar shield lichen to the one shown on the plum tree stump. Branch and trunk and rock host life on their surfaces, but we have to pay attention in order to see it. 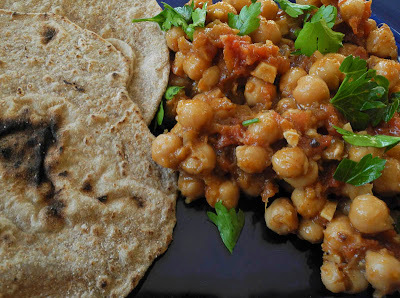 I love chickpeas; they're delicious in a variety of recipes. I have posted recipes for a savory chickpea and tomato soup, and a chickpea stew made with potatoes and tomatoes. This dish from Deborah Madison's marvelous book Vegetarian Cooking for Everyone is for those who love chickpeas, spicy food, and ginger. You can use the canned chickpeas for this recipe, but I always prefer starting with the dried and cooking them myself for better flavor and texture. I always make a double batch and freeze half for later use. Madison tells us that this recipe is inspired by a Bengali dish, so I decided to make some chapati to go along with it, though it can also be served with rice. Once the chickpeas are cooked, it's a snap to prepare. Put oil and onion in a large skillet. Cook at medium heat until the onions are well browned, 12 to 15 minutes. Lower heat and add the bay leaf and spices, 1/2 teas each of salt and pepper, and the tomatoes. Cook for 5 minutes, then add broth or water and chickpeas. Simmer until the liquid is reduced to a thick sauce. Taste for salt and add lemon juice. Serve with the garnishes on the side, or sprinkle over the chickpeas. And here for those of you who want to attempt making chapati, which is actually quite easy, is a recipe. It's from a very old cookbook that has simplified Indian recipes, called The Art of Indian Cooking by Monica Dutt; it's now a rare book, so super expensive. Mix salt with the flour in a bowl and slowly add water, mixing with your fingers. Add enough water for the dough to be soft. Knead the dough on a board for at least 5 minutes. Place the dough back in the bowl, cover with plastic wrap, and let sit for at least 1 hour in a warm place. Knead the dough again, then divide into small pieces, about 10, forming each into a small ball. Pat the ball of dough flat between your hands, then roll out on a lightly floured surface into a very thin 5 to 6 inch circle. If the dough sticks, you need a little more flour for rolling it out. Heat a griddle or skillet until it's quite hot. Place as many chapatis as will fit on the surface for 15 seconds, then turn with a spatula. 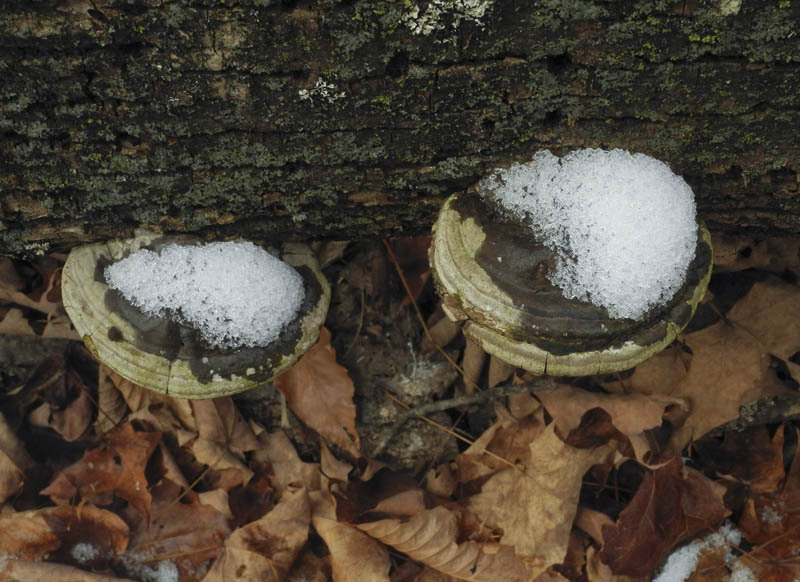 When brown spots appear, maybe after another half minute or so, turn it back to the first side. Gently rub the surface of the bread with the spatula, and it you're lucky, it will start to puff up. When it's got nice brown spots on both sides, it's done. You can spread the warm bread with butter or ghee if you like. Quick, simple, very very good. 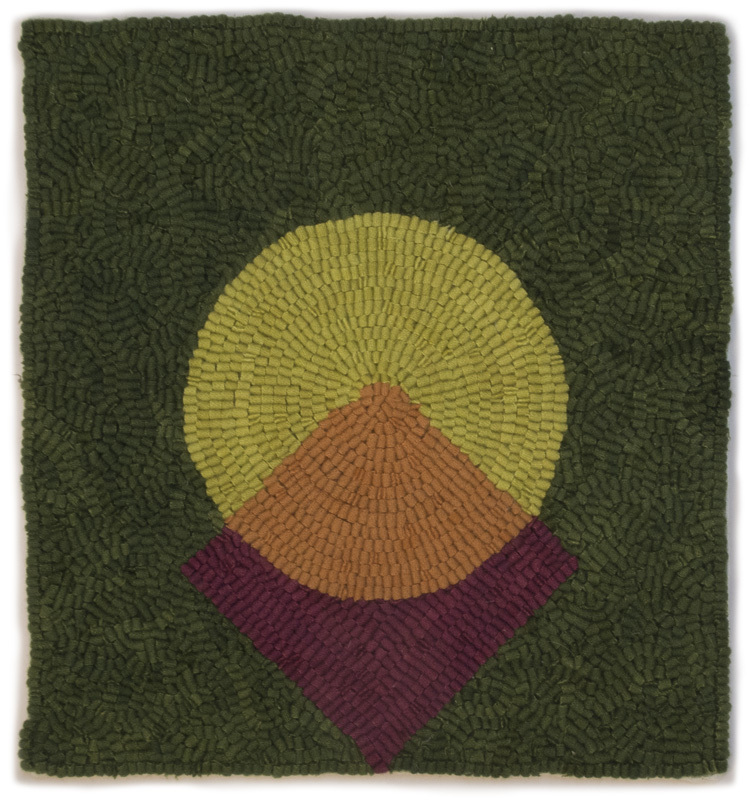 Transparent Circle, hand dyed wool on linen, 13 x 12 in. 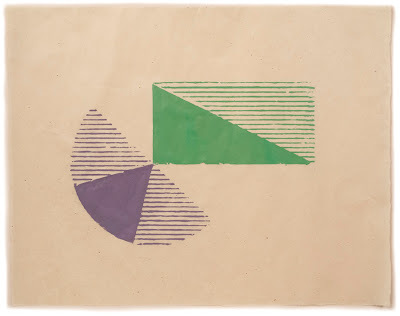 After finishing my last textile, Transparent Triangle, which you can see below or in this blog post, I was so interested in the character of the image and the feelings that it evoked that I decided to do a second similar work: two simple geometric shapes overlapping on a solid colored ground. 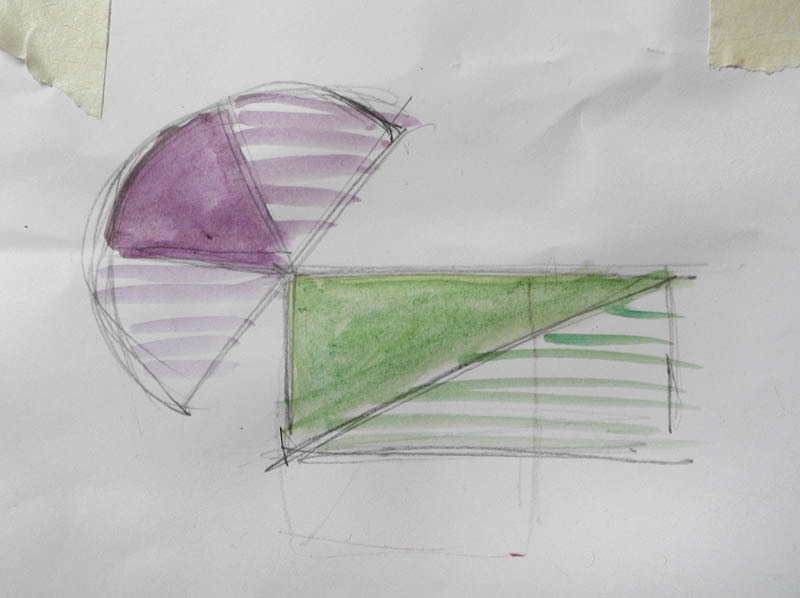 I kept the circle, superimposing it on a square balancing on a point. 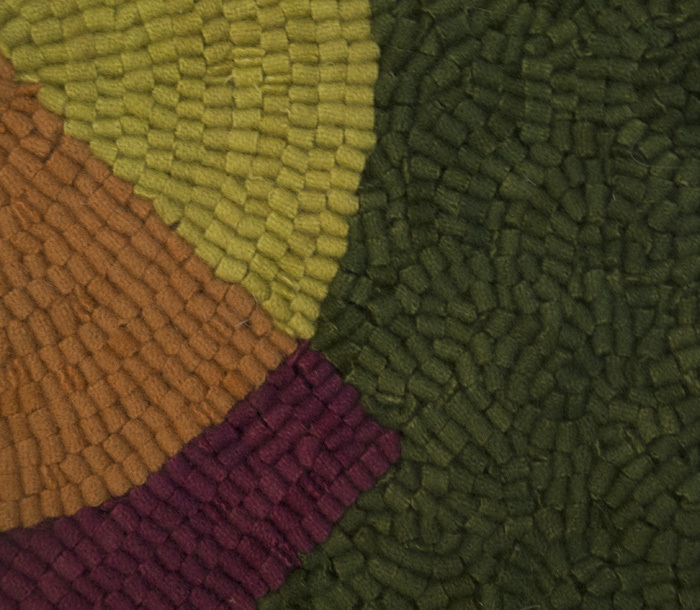 The circle's color is yellow, mixed with the background green and with the red, yielding greenish yellow and orange. 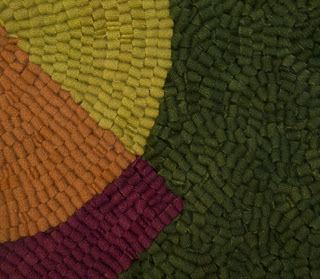 In this detail you can see the direction of the hooking; random for the background, and following the outlines of circle and square. Since the circle is on top of the square, it takes precedence in the hooking pattern. So what do I mean by the "power of color" in the title of the post? 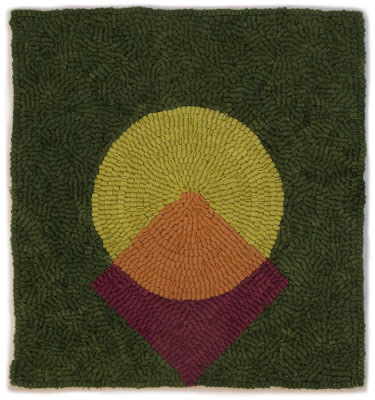 Primarily that the yellow circle seemed much larger in the finished piece than in my drawing study for the work. 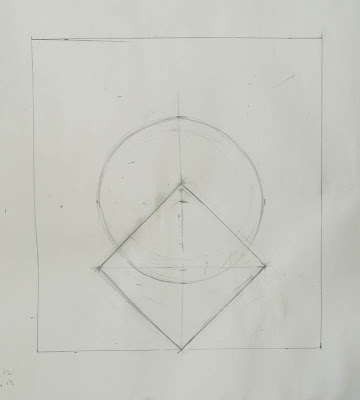 In the study, the balance of square and circle seemed more equal; the square seemed much larger in relation to the circle. Of course some of that is due to the fact that the pencil line for the square is darker, so has more weight. But once that yellow was added, an intense color even if it is a cool yellow, the relationships were thrown off. I even removed one line of hooking at the border of the circle, but it still seems too large. I wish I'd designed a larger square for this piece because I'm not entirely satisfied with it; it misses a "just-rightness" for me. Something else I noticed about color when placing these works side by side: Transparent Circle with its dark background appears smaller than Transparent Triangle with its yellow. When I first tacked the two up on the wall together I was befuddled: I kept measuring the new piece, making sure it was the same size as the previous one. I tried putting it on the right to give it more weight; nothing doing, it still looked smaller. The brightness of the yellow, even if it's a dulled ocher, along with the bright cherry red, pops that piece off the wall. It's as though one is a bold sibling and the other is shy. 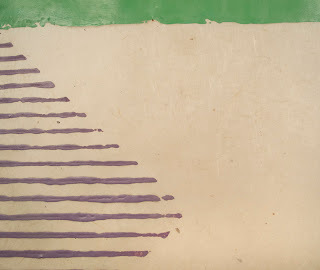 Here color is more than expression or mood, becoming a nearly physical manifestation in space. The cold weather of the past few days has kept a thin coat of snow here and there in the woods, thin enough to highlight forms rather than obliterate them. 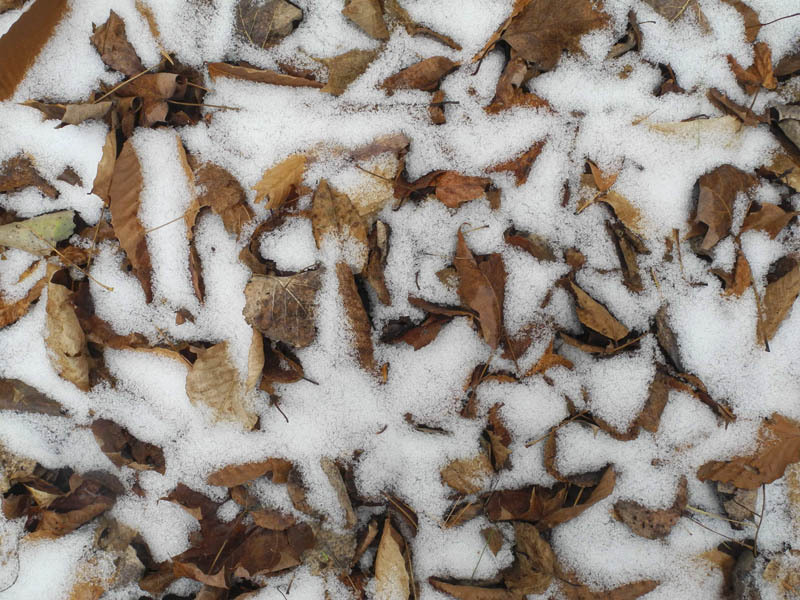 On the path, fallen leaves are floating in white, looking like marks of an active brush, reminding me of all-over abstract painting, such as that of Milton Resnick or Mark Tobey. 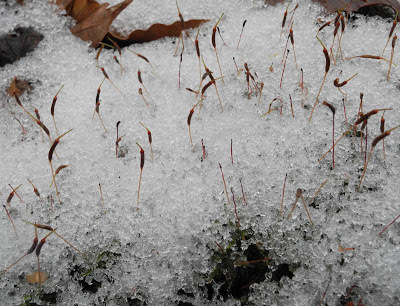 A more linear pattern is established by the thin fruiting bodies of moss rising above the icy snow. 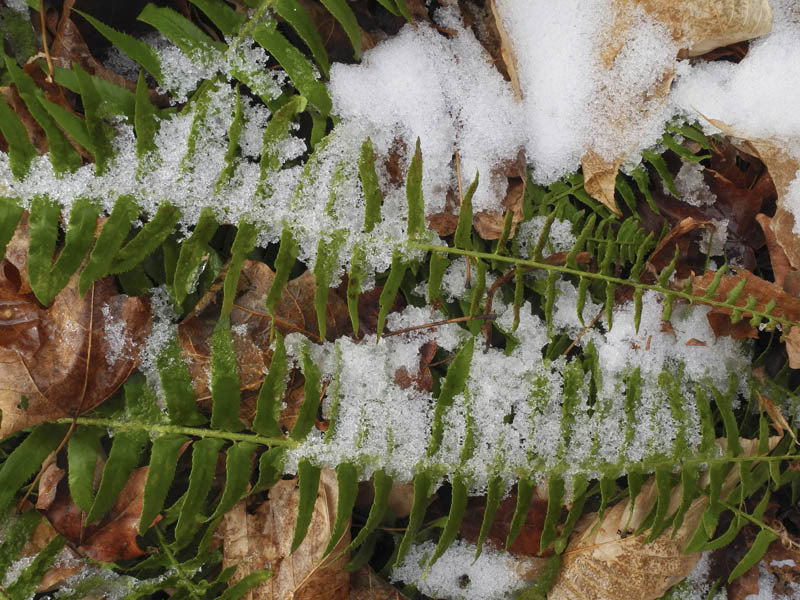 I become somehow more aware of the pattern of green ferns as I see them partially hidden by white. 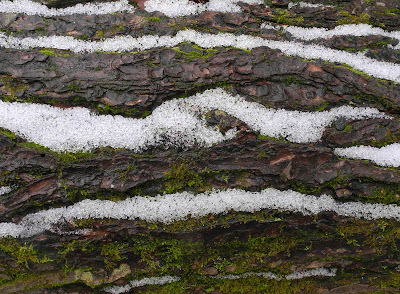 Snow has been caught in depressions of bark on a fallen tree, white lines like foam on the sea. White marks of emphasis are plopped on circular shelves. 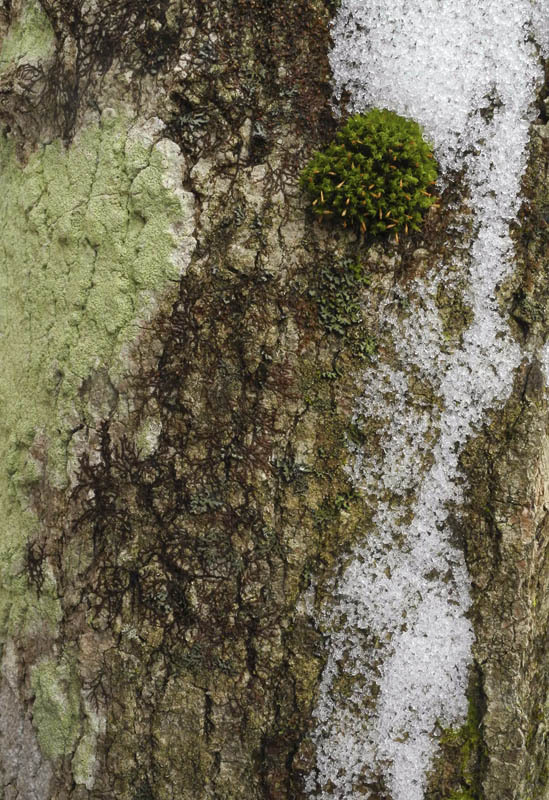 A downward sweep of snow is repeating the pattern of green lichen, brushed on the bark. On a muddy part of the path, ice has formed, delicate as lace, held above the now sunken ground. 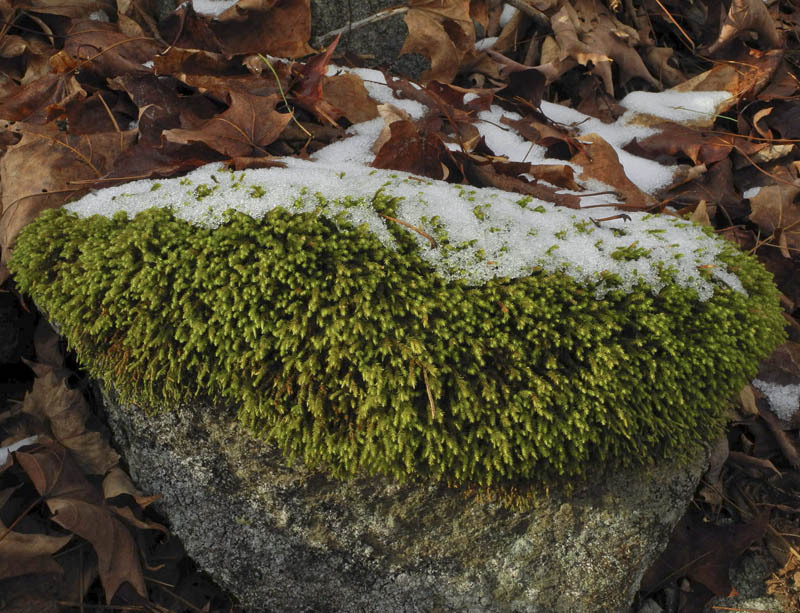 A bushy mop of moss seems held in place by a flat cap of snow. The sparkle of snowy granules repeat the shape and brightness of the tiny spheres of slime mold, each highlighting the other. Snow brings a new way of seeing the world. The Indian as he has hitherto been is on the point of passing away. His life has been lived under conditions through which our own race past so many ages ago that not a vestige of their memory remains. It would be a veritable calamity if a vivid and truthful record of these conditions were not kept. Although these words sound condescending towards aboriginal races, there is also great respect, and one senses nothing but that quality of attention and respect, and beauty, from Curtis's words and photographs. I wondered, while watching the documentary, how suspicious these peoples were of Curtis and his assistants: did they feel intruded upon, manipulated? Curtis recounts how difficult it was to overcome suspicion of them as strangers. 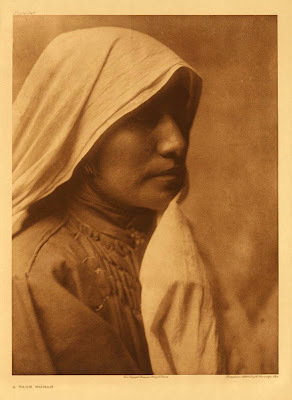 But he was nothing if not persistent, and we can see in his sensitive portraits of individuals an empathy, even a love, in the way they are portrayed. When the subjects are named, as in the portrait of Plenty Coups, there is a biographical sketch of the person. He was born in 1847. When he was sixteen his brother was killed by the Sioux and he climbed a mountain: "the spirits dwelt there and I sought their power." 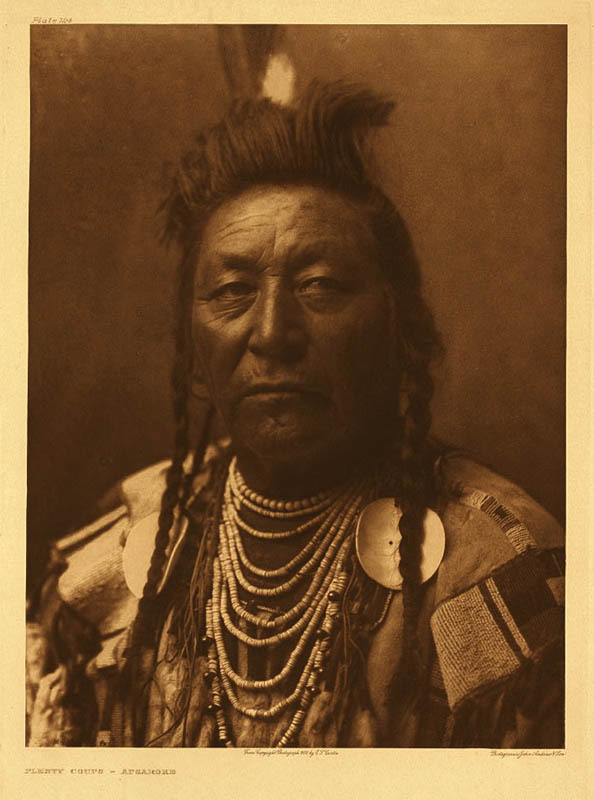 He was a great warrior and became chief in 1903. When I searched the term Walpi, which is a place in the Southwest, on the Northwestern University website, I saw extensive documentation of the tribes and pueblos, the ruins, the list of "principal informants", genealogies, and marriages. What I am struck by, however, is the intense humanity and deep feeling Curtis was able to elicit in his photographs. There is a serene dignity, even simple grandeur in this portrait. 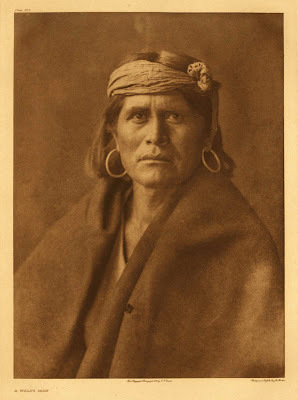 In this romantic portrait I see more of the pictorialist tradition, a soft painterly rendering of a beautiful woman. 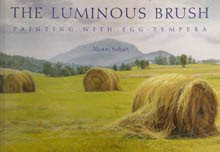 In addition to portraits, Curtis's text is richly illustrated with various aspects of daily life. 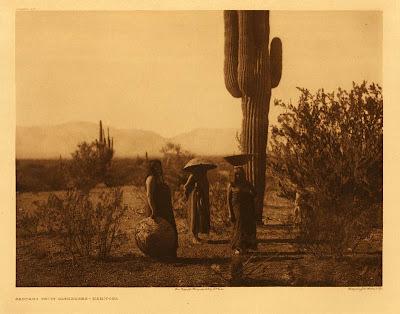 Here women are gathering the fruit of this giant cactus "which they relish in its natural state as well as in the form of wine or preserve." There is marvelous drama in this image of women dwarfed by the cactus rising above them. Curtis also demonstrates a strong compositional sense in a still life of baskets for seeds and nuts. 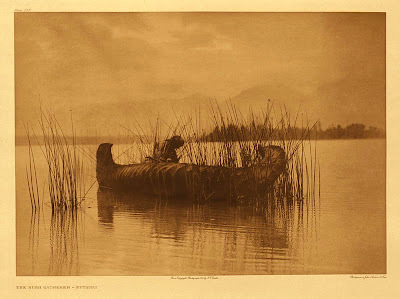 It is thus near to Nature that much of the life of the Indian still is; hence its story, rather than being replete with statistics commercial conquests, is a record of the Indian's relations with and his dependence on the phenomena of the universe––the trees and shrubs, the sun and starts, the lightening and rain,––for these to him are animate creatures. Even more than that, they are deified, therefore are revered and propitiated, since upon them man must depend for his well-being. How much better off we might be with a little more of this attitude in our contemporary culture. 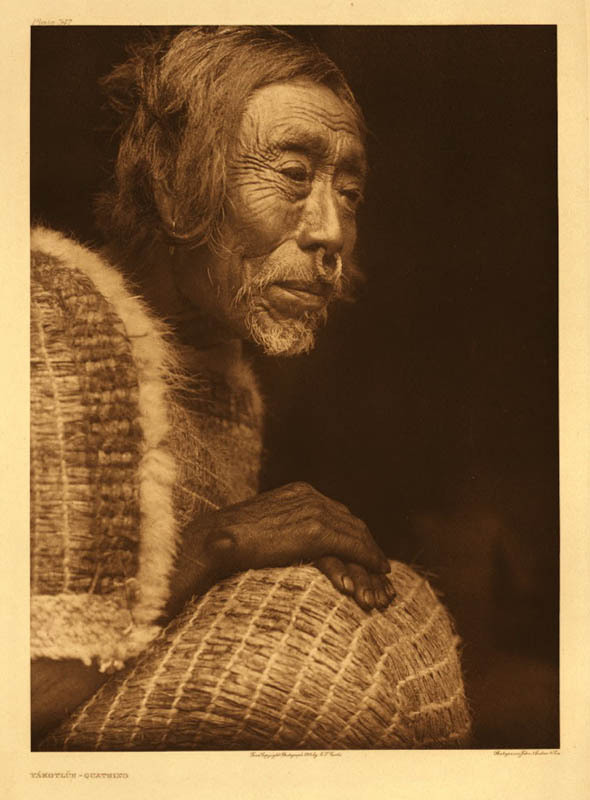 Curtis had an anthropologist working with him, Frederick Webb Hodge, who edited the volumes. 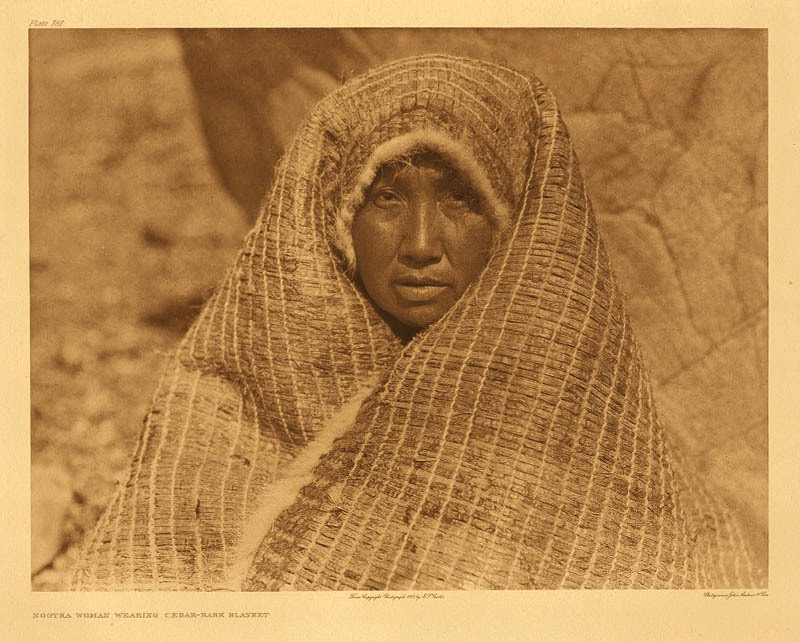 While the artistry of Curtis's photographs is clear, his work as an anthropologist has been questioned. 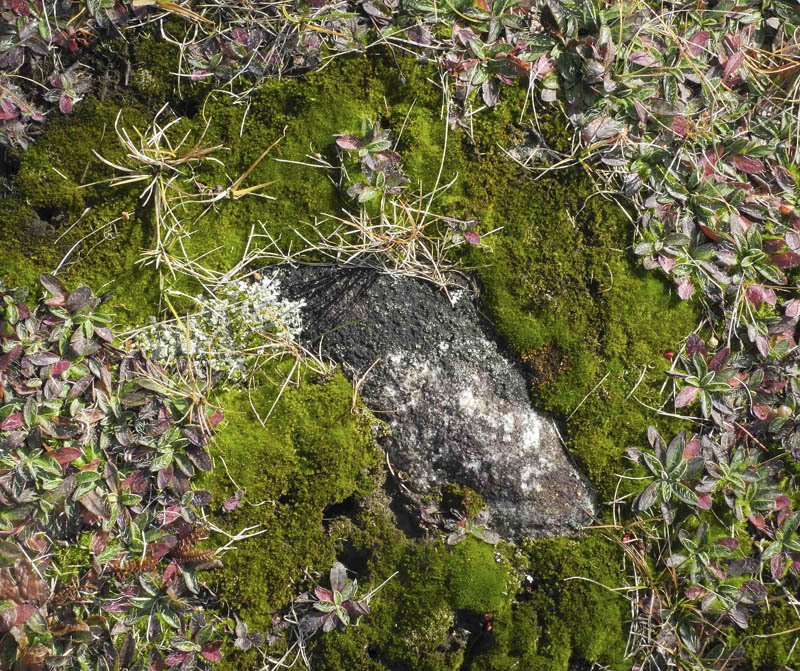 He carried a beaded shirt that appears in several photographs; there is evidence of his ridding a photo of a contemporary object, an alarm clock. 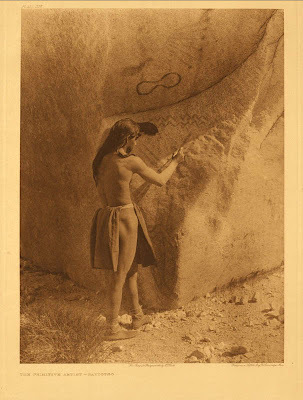 The description for this photograph describes it as a glaciated boulder "covered with phallic symbols in faded red". I wonder if the zigzag lines or the radiating lines topped with small circles could all be phallic; they seem to have a wider reference to me. 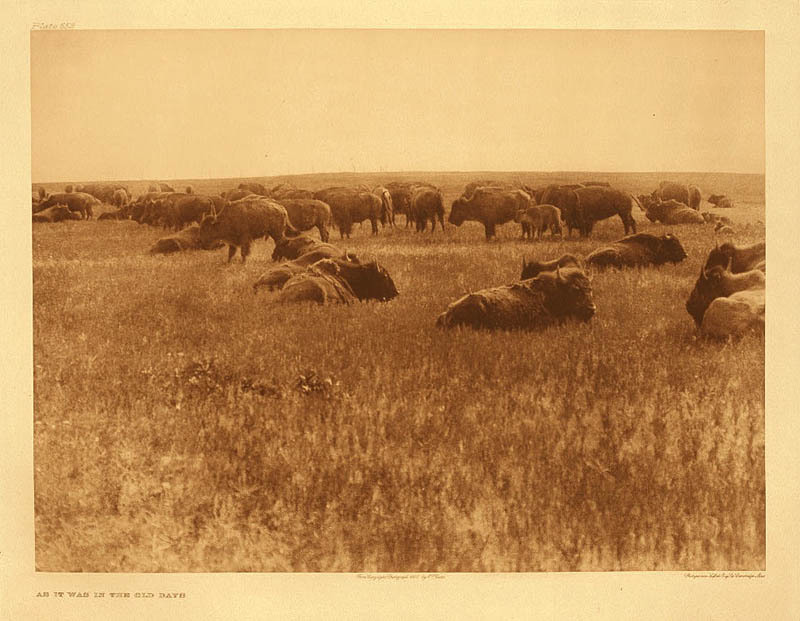 The bison was not only the chief source of food of the Plains Indians, but its skin was made into clothing, shields, packs, bags, snowshoes, and tent and boat covers; the horns were fashioned into spoons and drinking vessels; the sinew was woven into reatas, belts, ornaments, and the covers of sacred bundles; and the dried droppings, "buffalo chips", were used as fuel. So dependent on the buffalo were these Indians that it became sacred to them, and many were the ceremonies performed for the purpose of promoting the increase of the herds. 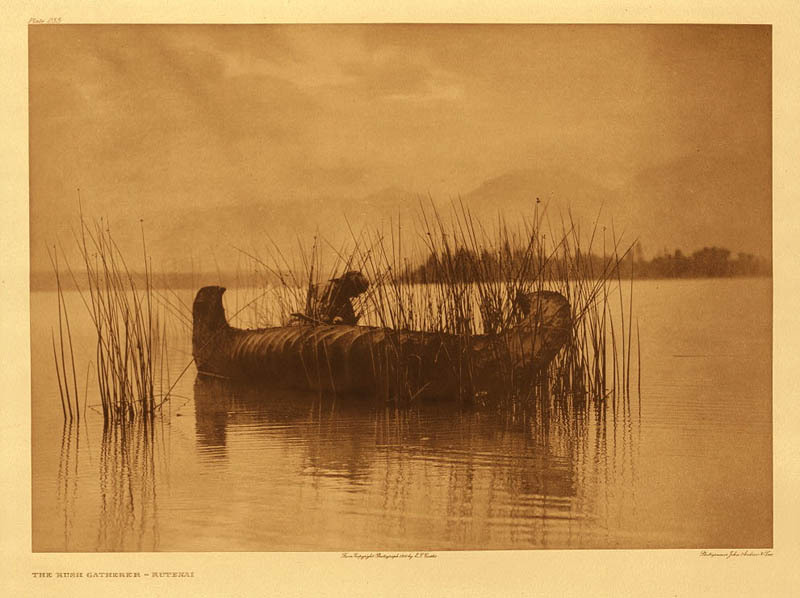 As one admires the beauty of the Curtis photographs they must be placed in a proper perspective. 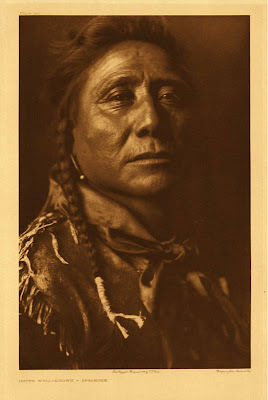 In spite of the dedication and hardships the photographer had to endure, the ultimate beauty of "The North American Indian" lies not only with the genius of Curtis, but also and most importantly, within his subjects. The native beauty, strength, pride, honor, dignity and other admirable characteristics may have been recorded by photographic techniques, but they were first an integral part of the people. 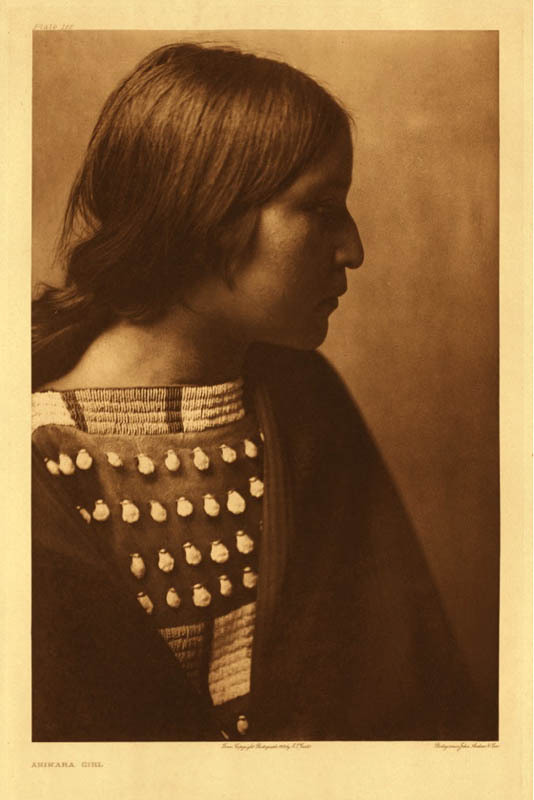 In his honoring of the Native American peoples, I believe that Curtis would agree with Horse Capture's assessment, but as an artist I have to say that the beauty of Curtis's work also came from his sensitive eye, his unerring sense of composition and light. His photographs are moving not only because of the subjects, but also because the photographer was a consummate artist. A New Textile: "Transparent Triangle"